I found a set of 8 notecards WITH envelopes at Mike's for $1.00. (now, what cardmaker can compete with that?????) Anyway, I really liked the rooster image. So, I cut apart the card front and made my own card. Chicken wire stamp is from Cornish Heritage Farms. Sentiment is from Hero Arts. Cardstock and oval punches are from SU! That is just too stinkin' cute!! Great idea. Did I buy those cards?! Gotta go see . 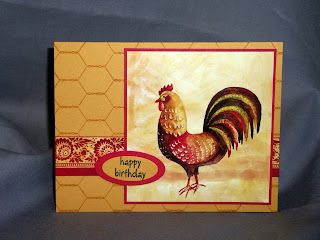 . .
Love that chicken wire stamp...very very cute! Can't wait to see you! Have a great weekend. Love the cutting apart and re-inventing!!! Great card! Love this idea. Will be scoping out Michael's for other possibilities. It's almost the end of September and no new post. I'm looking forward to seeing what you have been up to lately. Looking forward to seeing you soon.